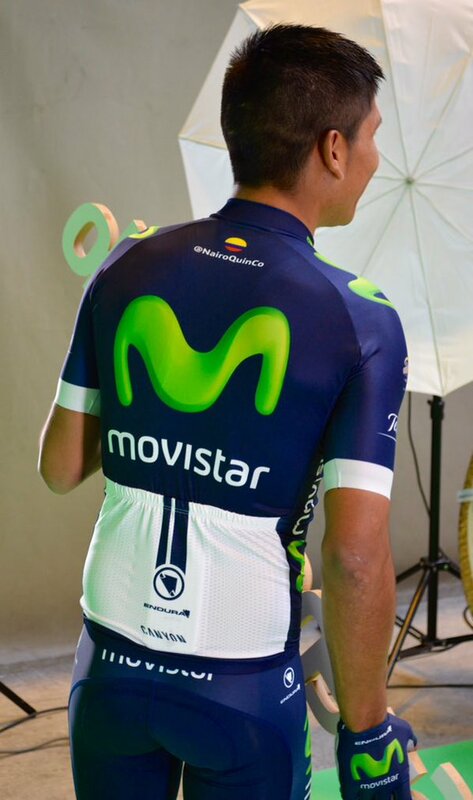 Spanish WorldTour team Movistar has unveiled its 2016 team clothing via a series of Twitter pictures of Colombian 2014 Giro d’Italia winner Nairo Quintana modelling the new strip. The distinctive team colours have not been radically altered for 2016, and retain the trademark dark blue background and distinctive green ‘M’ of telecommunications company and title sponsor Movistar. The most notable changes are a much more prominent ‘M’, which wraps around the entire front of the jersey. White cuffs have been added to the sleeves, and the rear pocket section is also now white. The kit is manufactured by Scottish cycle clothing specialist Endura. The shots of Quintana look to be behind-the-scenes images from an official team photoshoot. The squad, including British rider Alex Dowsett, is currently assembled in Gorráiz, Spain, for a pre-2016-season training camp and meeting, where riders will be issued with their kit. The 2016 WorldTour season commences in January with the Tour Down Under in Australia. Movistar ended the 2015 season as top-ranked WorldTour team, with the squad’s Alejandro Valverde the top WorldTour rider.